My husbear John and I arrived on Thursday, March 22nd, and settled into our room in the Hotel Monteleone (Tennessee Williams’s favorite New Orleans hotel) before heading off to Desire Oyster Bar, where we quenched our thirsts on Sazeracs and gobbled fried oysters, crab cakes, and shrimp rémoulade atop fried green tomatoes. Our after-dinner attempt to get a drink at one of Bourbon Street’s gay bars proved futile, however. When we got to the Bourbon Pub, the first episode of Season Ten of RuPaul’s Drag Race was playing on the televisions, and, from what we could tell, it was approaching its end. We’re both big fans of the show and were taping it, and we had no desire to see the result of the competition before seeing the competition itself, so we lurked outside (“like common trollops,” as I put it) on the street corner, waiting for the episode to end. Finally, impatient, we set out for another gay bar several blocks away…only to discover the same episode still playing on televisions there. The next gay bar even had the episode projected onto the wall of a building across the street! Defeated, we headed back to the hotel. No nightcaps in a gay bar for us. The good news is that we were later able to watch the complete episode on John’s laptop. Friday the 23rd, after John and I devoured muffulettas and Pimm’s Cups at Napoleon House, I attended a publicity workshop by Michele Karlsberg, one of my favorite festival participants (her Facebook posts about Trump, that fulvous swine, are priceless). That evening, John and I attended the SAS welcome party at the Beauregard/Keyes House, sipping prosecco and catching up with old friends like Sven Davisson, publisher of Rebel Satori Press, and his adorable husband, Nate. Afterwards, we continued our culinary adventures at the Court of Two Sisters, where I savored the best crabmeat au gratin I’ve ever tasted, along with asparagus and hollandaise. 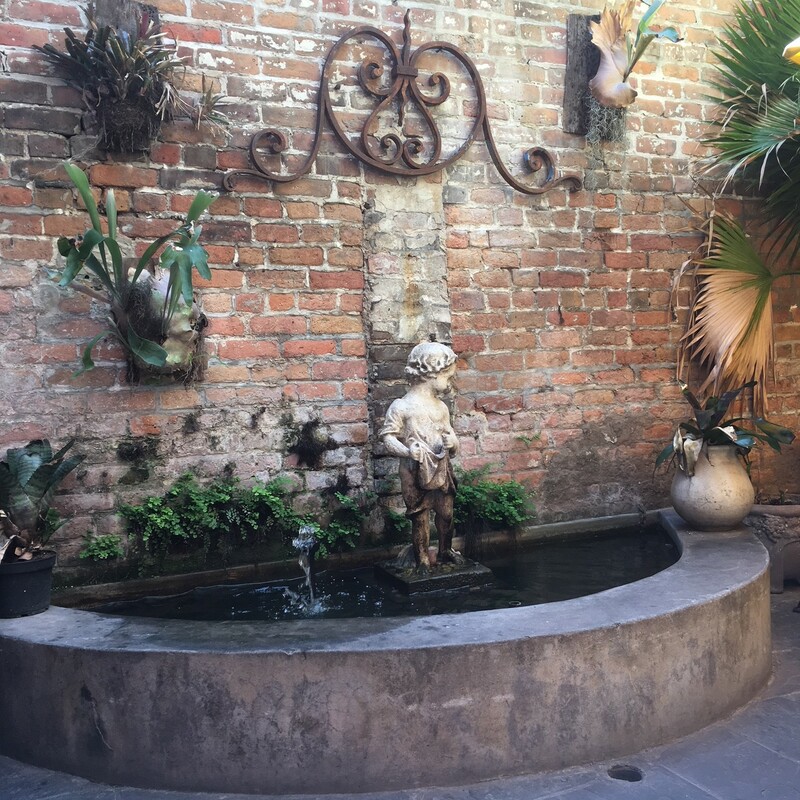 Saturday morning, I left John to sleep and grabbed an omelet, café au lait, and beignets at Café Beignet on Royal Street, the setting for one of my previously published poems. my fingers with lappable glaze. sweetness, its every available trace. Your post made me return to the thrilling days of SAS last year – thanks so much for the reminders of what we missed this year! Teresa and I had just been talking about what a good time we had at the festival last year – I must write another short story just so I get invited to come back. Hey, please come back to SAS! I’d love to see you again! Those Cafe Beignet beignets are delicious! I went Sunday morning very early, before the crowds, with Peter Gajdics from Vancouver. He pronounced beignets “just lumps of fried dough doused with powdered sugar.” I’m never speaking to him again. Hey, glad you enjoyed those beignets! It’s MUCH less crowded there than Cafe du Monde, but the beignets are just as delicious. 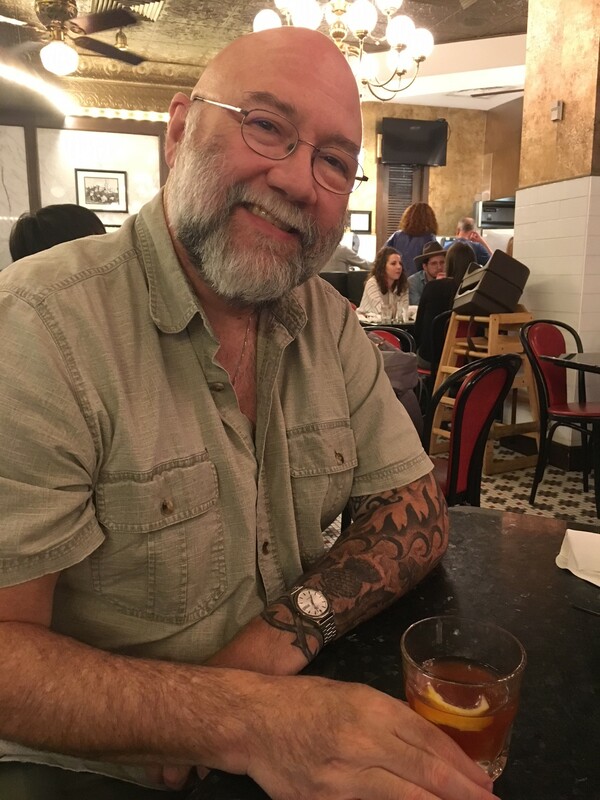 Thanks again for the drink at Mr. B’s Bistro. That was very kind of you!